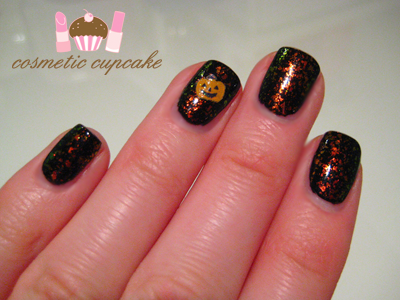 I have for you today my 1st ever Halloween manicure - a quick and simple NOTD using flakies and nail stickers. We don't really celebrate Halloween here Down Under however in recent years the presence of Halloween has increased. I would LOVE to go to the States during Halloween to enjoy the festivities! I started off with a coat of BYS Black Satin which I've featured in a previous post. I then applied 2 coats of Nubar 2010 flakie to get an orangey look. FLAKIES!! I just love the way flakies look and the way they look different depending on the lighting. I couldn't stop staring at my nails and my workmates were all gaga over the flakies too and they loved this mani! 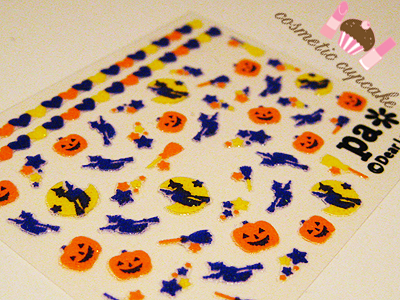 I then applied these totally awesome Pa Jack O' Lantern nail stickers (which I got from lovely Christina!) on my accent fingers and thumbs. I then topped it off with a coat of Poshe topcoat. On day 2 of wearing this I decided to matte-ify it using Essie Matte About You. I love the matte look! I think the flakies look even better and stand out so much more when matte. What do you think? Thanks for looking! Don't forget to enter my Polished Pink for October giveaway here! 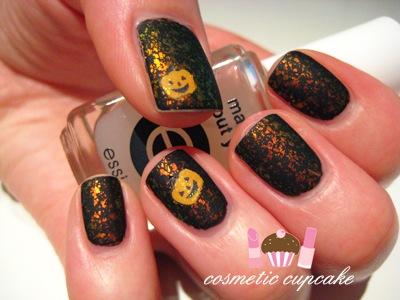 I agree with you on the matte look, it makes the flakes stand out much more :)! I like it better! that's so cute!! and perfect for work without being too out there. The flakies look great! I WILL GET THAT FLAKIE. I will one day, I will. I was swooning over the flakies as they were and then I saw the matte version and WOW. They look amazing! Adore!!! Nubar 2010 is the BOMB!!! @Nikki: The nail stickers just complete the manicure! It would be so awesome to experience Halloween I think - the costumes and the atmosphere would be so fun! @Monika: I'm glad you like the matte too! @Alice: I am so lucky Christina gave me the stickers, they are so adorable and special. I'm so happy you like the manicure Alice! @Annkiins: Oh I hope you're able to get your hands on flakies someday! 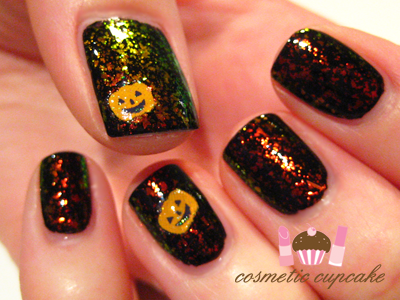 They just make dark polishes pop and they are just SO AWESOME. Can you tell I love flakies??! @Anita: I totally agree - who doesn't love flakies?? @Thrisha and Lily: Thanks ladies! @ohmerde! : Unfortunately both were purchased online from Ebay. Essie is available now at Myer however I'm not sure if they have Matte About you. They also sell for retail price which is $18.95 which is way too pricey! BYS recently released a matte topcoat so try that out I say =) I haven't tried it myself but there's nothing to lose! I'm pretty sure that Nubar is not available anywhere in Sydney so online is the place to go. Check out my "Where to buy" page at the top for a list of where I buy all my polishes! @Anita: Awwww I'm so glad you like it Anita! 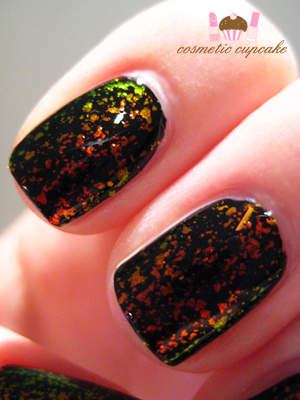 Flakies are so so awesome. @Jade: I couldn't agree more!!! =D It's like Christmas morning when I see flakies haha.